Don’t ask me what compels me to make some of my recipes. Sometimes it’s whatever is in the fridge. Sometimes it’s to try something challenging, or something I’ve never made before. Sometimes it’s just to entertain you, like these white trash cookies. I know you read that title and your first thought was “what could that possibly mean? !” Cookies made with jerky and pickles? Maybe tater tots? Could they be chicken nuggets thrown in the blender with some butter and baked into a oozy chicken monstrosity? Well, that last one seems doubtful. I mean, the ratios would be off. Duh. No, these White Trash Cookies are the epitome of tacky Americana. Classic chocolate chip cookies made with good ‘ol mayonnaise instead of butter or eggs and with some baseball style Blister peanuts thrown in for good measure. You’re drooling, and kind of disgusted with yourself. I get it, it’s all things wrong, bad and good rolled into one. I mean, salted peanuts in a cookie? Mayonnaise in a cookie?! How dare I?! Oh, but I did. And tomorrow when I see a few friends, I will be bringing these cookies. And they will love them. And I will not tell them they are white trash cookies. I might serve them with a side of my homemade beef jerky. Perhaps some pickles for garnish…see if they get the joke. Or maybe they’ll just think they are darn good cookies and no one will be the wiser. That is, unless they read this post. And then the taunting shall begin. For those of you that dare, recipe after the jump. Preheat oven to 350 degrees. Prepare cookie sheets with a spritz of oil. Combine dry ingredients in a large bowl. Add mayonnaise and vanilla and incorporate fully. Dough will be shiny looking and very moist. 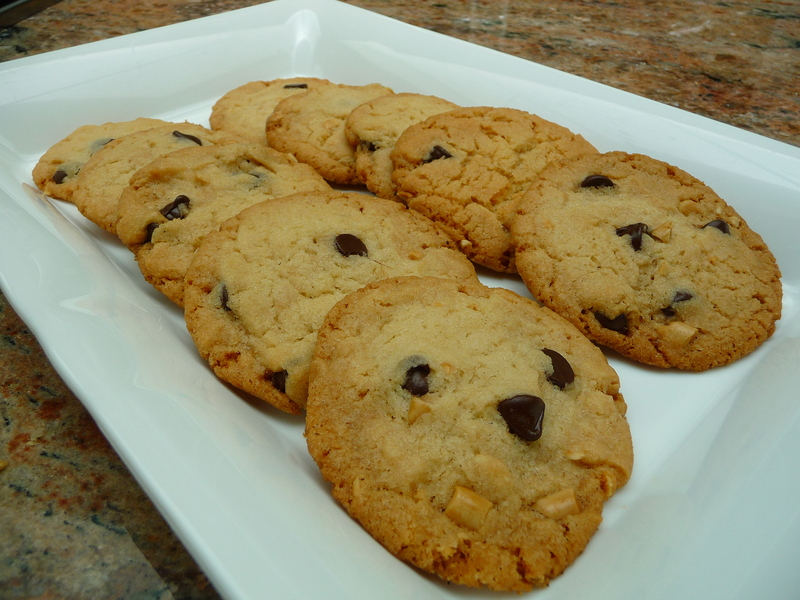 Mix in chocolate chips and peanuts. Using your hands, roll about one inch balls of dough, place on cookie sheet at least 2 inches apart. Press down lightly on cookies to flatten them. Bake for about 12 minutes, until edges are golden. Because of the mayonnaise these make for a delightfully crispy cookie. Serve with jerky and pickles. For a beverage pairing, I highly recommend Colt 45 or PBR. Budweiser would also be excellent with these. Don’t tell me I didn’t warn you.